If you struggle with hair loss and have spent any time researching the latest developments in hair restoration, then you have likely heard of platelet-rich plasma (PRP) therapy. PRP has been used for years to accelerate healing for orthopedic and cardiac surgery but has recently entered the cosmetic scene as a skin care and hair restoration treatment. With its recent emergence in the realm of hair loss, studies are still underway regarding PRP’s efficacy and its place in a comprehensive hair care routine for those struggling with genetic hair loss. At Carolina Hair Center, we are proud to offer this new and exciting treatment to our patients interested in the latest procedures. PRP therapy is a minimally-invasive hair loss treatment that utilizes the growth factors and platelets present in your own blood to combat the effects of age-related hair loss. As an autologous treatment, meaning derived from your own body, PRP therapy comes without the risk of allergic reactions or adverse side effects. PRP is derived from your own blood at the start of treatment. A small amount of your blood is put through a centrifuge machine to separate the blood cells from the plasma that is rich in platelets and nutrients. 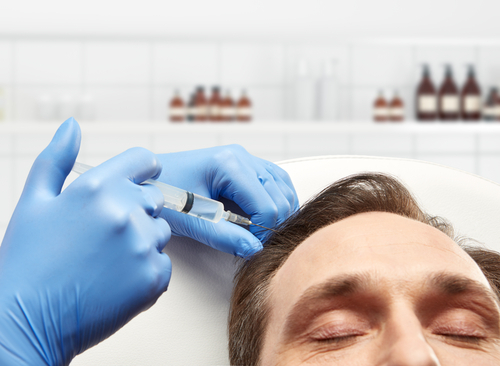 Once prepared, the PRP is then injected into your scalp to target areas that have begun to thin out with age. The direct infusion of growth factors and nutrients is intended to jumpstart the growth cycle of aging hair follicles and slow the process of shedding and follicle miniaturization. According to recent studies, PRP for hair restoration is an effective and safe treatment for the vast majority of patients. Most patients experience a favorable and noticeable improvement in the growth, thickness and density of their hair within weeks of undergoing a PRP treatment. PRP therapy will not completely regrow your hair or create new follicles, but it has been shown to reliably make a visible increase in hair thickness and fullness by reinvigorating and nourishing existing follicles. In order to experience the successful effects of PRP therapy, patients first need to be declared good candidates for the procedure by a hair care expert. While most patients experiencing androgenetic alopecia, or age-related hair loss, tend to be candidates for PRP therapy due to the procedure’s overall safety and lack of side effects, only an in-person consultation can accurately determine a patient’s candidacy for the treatment. While PRP for hair restoration has been proven to be a reliable treatment option, it does need to be regularly repeated in order to continue to experience results. Some clinics advise several treatments per year for optimal results. Having studied PRP therapy extensively and contributed toward its research, Dr. Cooley at Carolina Hair Center instead recommends a single annual PRP treatment for most of his patients. Who Is a Good Candidate for PRP for Hair Restoration? PRP for hair restoration can benefit just about every patient with androgenetic alopecia. PRP therapy is especially beneficial for male and female patients suffering from diffuse hair loss that affects the entire scalp, rather than just the hairline or top of the scalp. Patients with diffuse hair loss are not often viable candidates for hair transplantation surgery, the most effective form of modern hair restoration, so PRP therapy is often a welcomed addition to a nonsurgical hair restoration strategy. PRP therapy is also a useful tool for patients receiving hair transplants. The treatment can be used to complement the surgery by accelerating healing and new hair growth following the procedure. PRP can also increase hair density in the common donor sites along the back and sides of the scalp before patients undergo hair transplantation surgery. If you are struggling with male or female pattern baldness, then consider PRP treatments from Dr. Cooley at Carolina Hair Center. Supported by the efforts of a welcoming and professional staff, Dr. Cooley is proud to offer only the latest and most effective treatments at his clinic. To learn more about PRP for hair restoration and schedule a consultation with Dr. Cooley, call Carolina Hair Center today at 704-542-1601.